In these next BASIC’s we will be reviewing reports that were given during the 9th annual meeting of our lead pastors in India. This year we also invited men from our sister churches in Nepal and Myanmar. The picture you have in this BASIC is of the seven chairmen of the 16 BELC districts in India. “And He said unto them, Go into all the world, and preach the Gospel to every creature.” Mk. 16:15…It is a most comprehensive command; it knows no limit. The message of salvation is the only proclamation that has any authority and right in Christian pulpits…Martin Luther Bible School is primarily concerned with training young men who feel God has called them for full-time Christian service…We have started the MLBS on Feb. 20, ’07 with a full time two year pastoral training course in the town of Nagalapuram. The first batch of sixteen students took written and oral examinations on Jan. 5 and 8, ’09 and passed…We gathered on the roof of the building(rented)…the graduation students knelt for blessing…seven men proceeded in turn to each man and pronounced a blessing upon the head…The new sixteen graduated pastors committed and dedicated their lives to serve the living God…were assigned and took charge as pastors. The second batch of MLBS students began on Feb. 20, ’09…These new twenty men attend classes from 10-12:30 and from 1:30-3. Five teachers cover twenty subjects…in practical training one student goes with one BELC pastor attending morning and evening Sunday services…and they go along with district chairmen and pastors in visiting…We request you to please pray for us and for our ministry and for our future plans and the new batch of students at MLBS.May we win over Satan, this world and temptations with the mighty and great resurrected power of Jesus Christ…May the excellency of our God help us to hold firm and faithfully to His word. To God alone be all praise. These excerpts are taken from the district reports. Obviously not all of each report can be included in a BASIC. Prayerfully these excerpts will give you a picture of the work and much to pray over. The reports began with “Who desires all men to be saved and to come to the knowledge of the truth.” 1 Tim. 2:4 The chairman of each district is in a parenthesis. Uthukottai District(Sampath) – Forty-nine souls were baptized for the washing of regeneration. Gospel teams of seven pastors are visiting each and every congregation’s families preaching and praying for the sick and strengthening them in their faith. Chennai District(Rajamani) – Sixteen new pastors took examinations and with those that failed the first time retaking it and passing. Vaniyambadi District(Sampath) – At Kuttur 135 souls were baptized. Thirteen new pastors took examinations and passed. 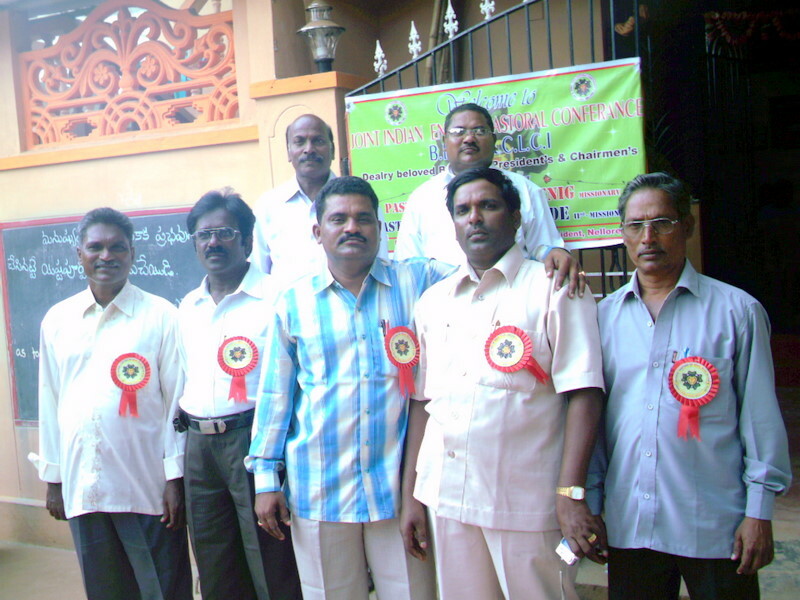 Chittoor District(Bhasker) – The newest group of pastors to study with us is in Chittoor beginning with 15 in January. Several pastors in the district arranged a joint Christmas service where 3500 came with 120 souls newly professing faith in Christ. These were then baptized. Koppedu District(D. Paul) – Each December 31st and October 31st special baptism services are held with a total this year of 121 souls baptized. Thiruvallur District(Rajamani) – In this newer district examinations on the catechism were held in August with the 35 of the students. Tiruttani District(D. Paul) – This is an area of very strong Hindu religious and ritual activities. Despite this in 33 villages the 25 pastors in instruction are working. August examinations on the catechism were given. Sri Kalahasti District(Bhasker) – At two congregations 35 adults and 21 children were baptized. Among these eight districts a Gospel team of 15 members is arranged to distribute leaflets, and the Gospel of John. Kadapa, Kurnool, Rajampeta and Rayachotti Districts(Victor) – In these four centers the regular meetings for instruction are held. There were 42 baptisms throughout these districts. In addition to the work here the chairman sends out 1000 copies of a bi-monthly magazine in Telugu. Nellore and Renigunta Districts(Moses) – A large evanglistic meeting was held sponsored by Renigunta men with several thousand attending. Andamans and Chengleput Districts(Deepak) – Due to a pilots’ strike delay out of the Andamans the chairman just made it to the meeting and no report was given. May our God be the chief cornerstone of our faith and the forgiveness of our sin. “Then why are you baptizing, if you are neither the Christ, nor Elijah nor the prophet?” John the baptizer is baptizing people. The message is sent asking why he is doing this. The Great Commission in Mt. 28:19-20 had not been given yet. Why is John doing this? One thing to realize is that God gave directions to John directly. He was a prophet as Jesus taught about John, a lamp burning brightly, not a greater prophet than he. Where in the Scripture can we find this prophesied about baptizing and where might John have looked? “I will sprinkle clean water upon you, and you shall be clean from all your uncleannesses, and from all your idols I will cleanse you. A new heart I will give you, and a new spirit I will put within you; and I will take out of your flesh the heart of stone and give you a heart of flesh.” Ez. 36:25-27 John’s baptism was a baptism of repentance. The prefiguring of baptism in Ezekiel for the days of the Messiah includes John’s baptizing. We find out from history that the Jews at this time were also practicing baptizing as a form by which people were admitted into their church. So what John was doing was not a surprise to the men who sent the inquiry. It was just that they asked why John was doing it. “From the days of John the Baptist until now the kingdom of heaven has been coming violently and men take it by force.” At first when one looks at this passage it seems rather negative. The word for violent is biazo in the Greek which means in a good sense “with burning zeal, triumphant force.” We think of the crowds who surrounded the Lord and John as they preached. These crowded in on them. Jesus gets into a boat to better speak to the crowd a bit away from the pressing crowd. We think of the vast crowds who came out to John at the Jordan. There was definitely a hungering and thirsting after righteousness, a yearning. A roof would be taken off a house so that Jesus might heal a man. What a time that was when John went before the Lord as the forerunner and Jesus came as the Messiah.